Great product! Perfect for a multitude of skin related needs and feels great on the skin. I usually scar easily, but this has been healing cuts fast, without leaving scars behind! Highly recommended! Wow is all I can say, My daughter suffers from Eczema and this gave her relief. By no means did this miraculously cure her eczema but it for sure gave her relief when she would get bad outbreaks. It is now packed in my travel first aid kit 🙂 Thanks again! this is some amazing stuff i reallly liked it for sunburns and also it worked great i haad a cut that just did not want to heal started getting a lil red and sore so i used this regularly and in a few days i could see a big difference it really helped me heal i def would buy and reccomend this product. Our five year old German Shepherd was always very active until we noticed her skin had become very irritated and raw from her scratching excessively. She had scratched herself raw! Her playful spirit no longer existed due to how these irritations made her feel. She looked so sad and uncomfortable with all the sores covering her body. I decided to use Nature’s Aid since it worked so well for me for many years. Any irritation, acne and of course…first aid were quickly healed. 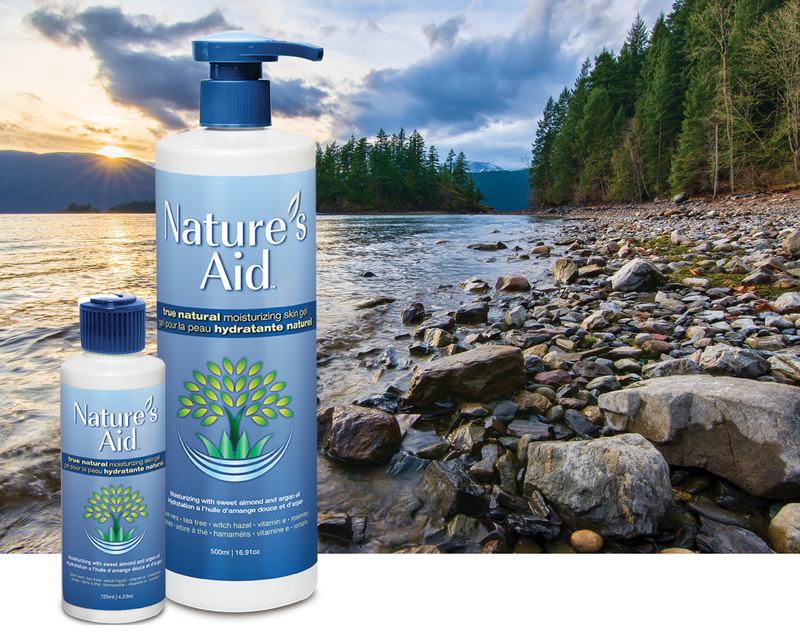 I absolutely love Nature’s Aid because it really works! Within a matter of days, the sores were completely healed and not a single scar in sight! I applied Nature’s Aid every morning and every night. I suppose she knew that Nature’s Aid was helping her because she would run to me whenever I had the bottle in my hand. Thanks to Nature’s Aid, her beautiful coat and spirit returned! I highly recommend for a variety of uses. I have successfully used it to heal eczema on myself and my children. I used it on an overreach injury to promote healing of the scar tissue. This injury healed with NO SCAR on a Thoroughbred horse! It is wonderful! Not only do I recommend Nature’s Aid Skin Gel to my clients, I’ve also successfully used the gel on my dog’s chronic skin condition. Medications have not been effective. When I applied the gel, the rash was significantly decreased without irritation. A fabulous product!! Recently I purchased a bottle of Nature’s Aid while I was in Sudbury. It was for my golden retriever who has skin problems. I also tried it on my own skin and was very surprised at how well it work. I’m very happy with your product and would like some information on selling this product in my town. I do have a small natural skin care business and would be really interested in promoting your product. Please send me information to the above email address. Thank You Very Much! My 4 month old puppy had this strange looking rash on his groin, I made an appointment with the vet for later in the day. In the meantime I applied Nature’s Aid to the area and was quite liberal with the application. When we got to the vet the rash was about 70% better, I was amazed. This product is really the best gel I have come across, it has helped my own skin with dryness and it eased my heel pain. I highly recommend it! I am very impressed with the results from your product, I looked all over the place for a product for equine warts but was not able to find anything. I searched remedies online, tried them all, but nothing worked. I started applying your product at least twice a day and sometimes up to four times a day, the warts started to dry out; sometimes they would bleed, but it seemed after they bled they would go away. I did pull a few off every now and then when they were real dry and hanging. I am so glad I noticed that your product advertisement on the inside cover of the Greenhawk catalogue because I had been in to ask them what would work for the warts and they had no idea. NO one seemed ever to have heard of horse warts before and I asked everyone that I knew that had horses young and old. I work for the Victoria Order of Nurse (home care), and I was even asking clients, their friends, and family.